I’m looking for a Fisher Price 1987 No. 8015 Puffalump purple pig. I’d like it to be in good condition and to have her own dress. Purple Puffalump pig is made of extra soft fabric, about 14″ tall. She is feather light, has white yarn sprouts of hair on top of her head, and brown stitched eyes. Pig has purple ears with pink inner ears, a large round pink snout with 2 pink stitched nostril holes, and a mouth with a big bottom lit. Pig has purple arms and legs with white rounded “hooves” on the ends. Pig has the Puffalump trademark symbol on the bottom of her left foot. 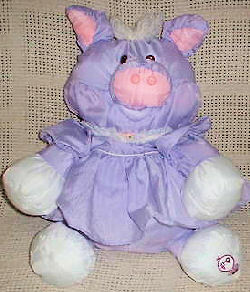 The pig wears a purple dress with purple puffy sleeves. The sleeves have elastic around the cuff. The dress has a white collar with lace trim on the edges and a pink ribbon bow in the center. The dress has a thin pink trim across the chest, and the bottom section of the dress is gathered across the top, but hangs straight down with no trim on the bottom edge of the dress. As I was a child, my mother used to give me a Puffalump every year – I guess it was every time she got her job confirmed for another year. I treasured the Puffalumps a lot, and they still sit on my bed. Now she’s going to quit work due to her age, and I thought it would be a good idea to give her the purple pig, which is the only one she did not give to me. That’s why I’m looking for it. I live in Italy, and I’m having trouble finding one with the dress that will ship to me. However, maybe I was able to find the pig on the web… I’ll let you know. Thanks, Susan. I’ve passed the link along. Here’s another one if anyone else is looking for this pig.